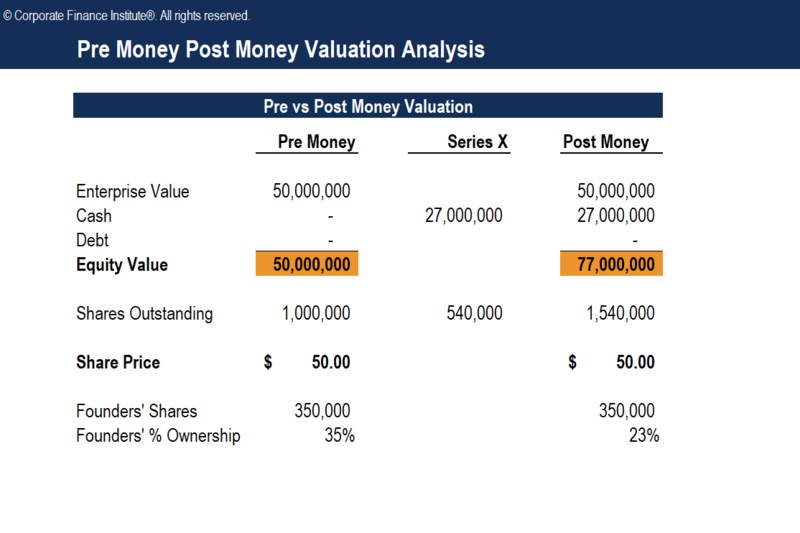 This pre money post money valuation analysis template will help you calculate the post money valuation of a company undergoing a Series X funding round. What is Post Money Valuation? Post money valuation is the equity valueEquity ValueEquity value, commonly referred to as the market value of equity or market capitalization, can be defined as the total value of the company that is attributable to shareholders. To calculate equity value follow the examples and step-by-step instruction in this straightforward guide from CFI. of a company after it receives the cash from a round of financing it is undertaking. Since adding cash to a company’s balance sheet increases its equity value, the post money valuation will be higher than the pre money valuation because it has received additional cash.